This license key will enable you to download the exFAT driver for your ASUSTOR NAS device. 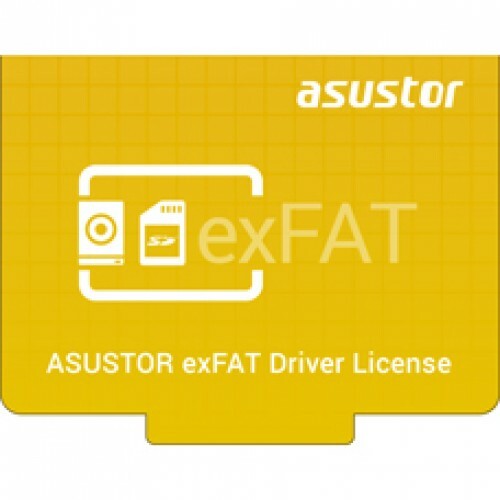 With the exFAT driver your ASUSTOR NAS can read and write to devices that have been formatted with the exFAT file system including, but not limited to USB flash drives, memory cards and external hard drives. After you make a purchase, your license(s) will be sent to the email address you used to register with the ASUSTOR online accessories store during normal working day (9:30AM-6:30PM, Monday-Friday, GMT+8). 1. You must purchase a software license in order to use the exFAT driver. Purchased license keys can be only used on one ASUSTOR NAS at a time. License keys, after unbinding can be transferred to another ASUSTOR NAS for use. 2. This product is a digital version. Learn more: ASUSTOR Colloege - NAS 160_How to access exFAT Drive?